It’s a noisy atmosphere out here at the Nigerian Theater of Dreams, where indeed dreams are coming alive tonight. You are live at the election stadium and I, Samuel Ufot Ekekere, am bringing you live report of this rendezvous. I will be doing this all alone. The prelude to this game has being as much as we anticipated. 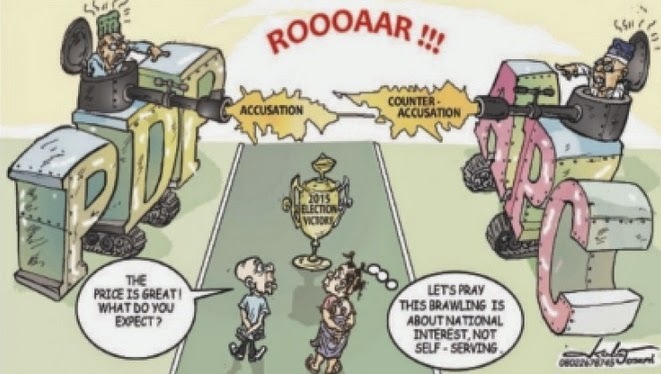 It’s between the two strongest teams ever in Nigeria’s political history, PDP and APC. The merciless PDP have being in top form in the last four seasons coming top of the league. They’ve being consistent and hope to continue in this trend. APC are new comers to this scene. It was actually renamed after a coming together of ACN, CPP and ANPP teams, teams which could hardly match the PDP’s fantastic squads through the years. The new team has got lot of money to spend affording loan deals for some retired but spectacular players from the PDP and other parties. The stadium is jam-packed to capacity, over 200 million people watching from the stands in this fantastic arena. Nigerians have being anticipating this tight matchup between these two sides. 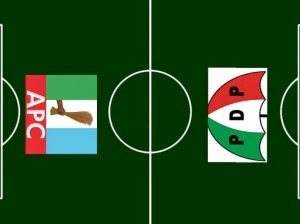 You will recall the match between PDP and AD in ninety nine. It was such a close one however team PDP won. It’s being easy all the way for this side that has produced all the biggest names in Nigeria’s political scene. They are a young side though, quite a departure from how the team had looked some few years back thanks to the excellent work of team manager Muazu and Captain Jonathan. The managers on the two sides have being excellent. Muazu team manager of the PDP has proved his onus as he single handedly returned the PDP to the state it currently is today with his fine tactical acumen. This team had dwindled in form during the last season but he has managed to bring them to competitive fitness even though there are still doubts as to the strength of his side for this game. Odigie Oyegun APC Manager has shown great class in understanding where his money has to go to. He has bought some of the finest players at a great bargain. Team PDP acted too late to retain some of her stars thus allowing some fantastic players in the mould of Amaechi, Rochas and others sign deals with the APC. The APC though seems to be in the form of their lives as they feel strong enough to challenge the PDP. I can tell you with certainty that the squad this two sides are parading will offer you great entertainment from start to finish. Team PDP has some very proficient legs as they play their traditional 4-4-2 defensive game. The incredible attackers, captain Jonathan Goodluck and vice captain Sambo have being threatening on all cylinders and they are assuring of more goals, Akpabio the massive attacking midfielder is promising to string even better crosses, Fayose is the die hard central defensive midfielder, isa yuguda commands the right wing, Surllivan Chime schemes from the left, Idris Wada is a central midfielder alongside Jonah David Jang, Saidu Dakingari defends from the right, T A Orji defends from the left, Olusegun Mimiko stands in as goal keeper while Seriake Dickson, Emmanuel Uduaghan, Ibrahim Hassan, Muktar Yero, and Imoke wait their turn at the bench. Team officials include Anenih who is technical adviser, Clark is coach, Orji Uzor Kalu is team media executive, Ngozi Iweala is team accountant amongst a long list of big names. On the APC side, we have Buhari and Osinbajo both captain and vice captain leading the attack in a massive all attacking 2-1-4-3 strategy. They both are in the form of their lives even though reports reaching us say Buhari may be injured. We can’t really confirm that report as the attacker is proving beyond doubt why he should be considered a real threat. His able co-attacker has also being supplementing the goals. Everywhere around the stadium, these two attackers seem to be the biggest names as placards can be seen celebrating them. In this team, Rotimi Amaechi plays as supporting striker, Rochas Okorocha and Raji Fashola are central midfielders, Aliyu Wamakko is left winger, Abdulfattah Ahmed is right winger, Rabiu Musa Kwankwanso is central defender, Adams Oshimole defends from the right wing, Rauf Aregbesola defends from the left while Maru Tanko stands in as goal keeper in what promises to be an all attack formation. On the bench are Ibikunle Amosn, , Abiola Ajimobi, Ibrahim Geidam, Abdulaziz Abubakar, and Kashim Shettima. APC team officials includes Tinubu who stands as Coach, Audu Ogbe is technical adviser, Sanusi is team accountant amongst a list of prolific superstars. Both teams have a bunch of quality reserves they hope to make the team once these set of legs retire. We must be on the lookout for rising stars such as Wike, Udom, Murtala Mohammed, Mohammed Abacha, amongst others in the PDP feeder team. The APC are also furious with men such as Dakuku, Umana, Fayemi, amongst their large feeder squad. The fans are already buzzing with excitement. Fans wielding brooms are on the right side of the stadium. Those with umbrellas are on the left. The fans are shouting at the top of their voice with voovoozelas hailing their superstars as they step in to the pitch. Match commissioners are representatives from civic organizations, international organizations, mass media, European union, United states, Asia union, African union, Ecowas, as well as local observers. Professor Jega the referee has promised a fair game. There is tight security all over the stadium as police and army officials are in the lookout for any unwanted intruders such as Boko Haram or crowd disturbers. The teams are all filed out as they perform the normal traditional introduction. PDP are defending at home while APC are attacking away. APC though are expecting a massive turn of events as they hope to stop the unbeaten run of the PDP and get the chance to play at home. Greeting formalities are over and both sides take positions on their side of the pitch. PDP is playing from right to left while APC is playing from left to right. Jonathan and Sambo are at the centre of the pitch as they await the referee’s signal for the commencement of the match. While we await the kickoff, I’ll feed you with events that happened prior to this match. The two captains have being promising a massive encounter. Buhari promised team PDP a fury of goals. As usual, Captain Jonathan referred to Buhari’s words as mere blabbing. Amaechi a loaned player from the PDP who now plies his trade with APC had threatened Jonathan over the use of his new forty thousand capacity stadium saying that his people’s army would silent the PDP if they play in that stadium. Well, Jonathan and his Team PDP played there and the APC team went speechless. There was no people’s army and there was no Amaechi around. All the tactical calculations from both teams to ensure their current captains weren’t made captains failed so the two captains have to face themselves against the campaigns against them. Ladies and gentlemen, it should be kick off time but the lights have gone off in the stadium. It’s the Nigerian factor again. I can’t find my way currently. I guess the game will be postponed. Oh yes the match has being postponed. We will have to wait till power holders give up their power in March 2015. I would love to see a live commentary of hte election here. GUY!UR TOO GOOD. U REALLY GOT TALENT. GOD BLESS.